In the NBA, it was Game 1 of the Western Conference Finals between the Oklahoma City Thunder and the San Antonio Spurs. This is the match-up that everyone has been waiting for in the West; two teams that are firing on all cylinders. Game one was neck and neck in the first half. Kevin Durant had one of his standard amazing nights with 27 points and 10 rebounds, and the Thunder even had an 8 point lead at the end of the third quarter. But the Spurs are known for saving their best basketball till the end. And that’s exactly what they did. The Spurs just exploded, playing stellar defense and hitting all their shots. 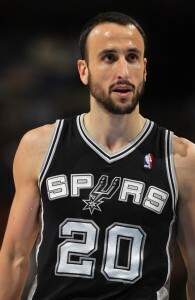 Manu Ginobili was in solid form for the Spurs, putting up 26 points on the evening. The Spurs won this game handily at the end (regardless of the final score), and didn’t even play their best basketball. With the win, the Spurs have won 19 straight games, and haven’t been beaten once in the playoffs. Wow! San Antonio 101, Oklahoma City 98. 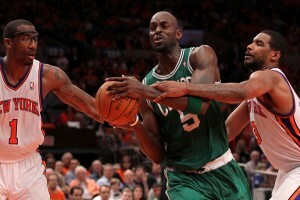 Then, it was Game 1 of the Eastern Conference Finals between the Boston Celtics and the Miami Heat. Everybody expected the Heat to dominate the Celtics, but Boston had no intention of lying down in Game 1 (or any game of this series). Kevin Garnett is playing some of his best basketball this season (saving his best for the playoffs), and he posted a great night for the C’s (26 points, 10 rebounds). But, remember, the Celtics are an aging team that tries to play the game at their slower pace — a half court game. That’s nice, but it definitely didn’t work against a very fast Miami team (who is also extremely tenacious on the defensive side). LeBron went crazy again with 32 points and 13 rebounds, as the Heat simply rolled through the Celtics in the 4th quarter en route to a Game 1 win. This series might be over in 5. Miami 93, Boston 79. It looks like the San Francisco Giants may be getting a new, unlikely employee. Barry Bonds had his glory days with the Giants, shattering the top two records in the sport — home runs in a season, and all-time home runs. However, he was ostracized from the sport for steroid abuse, and many wanted asterisks next to his name in the record books. 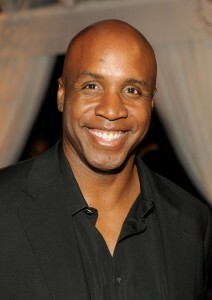 Bonds was never convicted for steroid use, but is referring to himself currently as a convicted felon (he gave an evasive answer to a grand jury in 2003). Now, it looks like Bonds wants to work for the Giants in some capacity — potentially as some kind of baseball adviser. Giants ace Tim Lincecum has been struggling as of late, and Bonds says he would have the answers for him if Lincecum sought his advice. Bonds really wants to help the Giants, but will the Giants give him a chance? We shall see.